For other uses of Cromarty or Cromartie, see Cromartie. Cromarty ( /ˈkrɒmərti/ ( listen); Scottish Gaelic: Cromba, IPA: [ˈkʰɾɔumpə]) is a town, civil parish and former royal burgh in Ross and Cromarty, in the Highland area of Scotland. In the 2001 census, it had a population of 719. The name Cromarty variously derives from the Gaelic crom (crooked), and from bati (bay), or from àrd (height), meaning either the "crooked bay", or the "bend between the heights" (referring to the high rocks, or Sutors, which guard the entrance to the Firth), and gave the title to the Earldom of Cromartie. In 1264, its name was Crumbathyn. The town grew around its port, formerly used by ferries, to export locally-grown hemp fibre, and by trawlers trawling for herring. The port was a British naval base during the First World War. HMS Natal blew up close by on 30 December 1915 with a substantial loss of life. The port was home to Britain's smallest vehicle ferry, the Cromarty Rose, running across the Firth to Nigg. The Cromarty Rose was sold in 2009 and replaced for the 2011 season by a new four-car ferry called the Cromarty Queen, which continued the service from 2011-2014. After a year with no ferry in 2015, new operators, Highland Ferries, were awarded the ferry contract and re-commenced the regular service between Cromarty and Nigg with the Renfrew Rose running from June to September, from 8:00 a.m. to 6:00 p.m. daily, once again offering a direct route North from the Black Isle. Cromarty is architecturally important for its Georgian merchant houses that stand within a townscape of Georgian and Victorian fisherman's cottages in the local vernacular style. It is an outstanding example of an 18th/19th century burgh, "the jewel in the crown of Scottish Vernacular Architecture". The thatched house with crow-stepped gables in Church Street, in which the geologist Hugh Miller was born (in 1801), still stands, and a statue has been erected to his memory. To the east of the burgh is Cromarty House, occupying the site of the old castle of the earls of Ross. It was the birthplace of Sir Thomas Urquhart, the translator of Rabelais. The burgh is also noted as a base for viewing the local offshore sea life. These include one of the most northerly groups of bottlenose dolphins. Cromarty, along with Chanonry Point just round the coast, is one of the best places in Europe to see these animals close to the shore. The University of Aberdeen Department of Zoology Lighthouse Field Station is based in Cromarty. Famous former residents include standing high jumper Hannah Meikle. Scottish writer Ian Rankin uses a "bolt-hole" in Cromarty when writing novels. 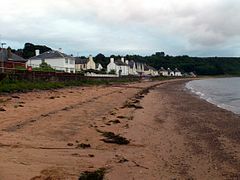 Cromarty gives its name to one of the sea areas of the British Shipping Forecast. The small community is also known for being a hub of creative activity including a number of promotional groups and several arts venues, and the town hosts its own Film Festival each December, the Cromarty "My Favourite Film" Festival. Guests of the 2008 festival included Kirsty Wark and Alan Clements, Donald Shaw and Karen Matheson, Janice Forsyth, David Mackenzie and Michael Caton-Jones. Each guest selected five of their favourite films, one of which was shown during the weekend. In addition to the Favourite Films, there is an outdoor screening on a Gable End, Scottish Gaelic Short films, Animation workshop, photographic exhibition and late night Pizza and Film screenings. All crammed into one weekend in a small town in the Highlands. The site of the town's mediaeval burgh dating to at least the 12th century was identified by local archaeologists after winter storms in 2012 eroded sections of the shoreline. A community archaeology project, which began in 2013, is investigating the remains of roads and buildings at the site on the eastern edge of the present town. There is a legend, dating from around 1740, that a Cromarty man named John Reid was granted three wishes from a mermaid, and that he used one of the wishes to marry a woman named Helen Stuart. From 1832 to 1918, Cromarty was a parliamentary burgh, combined with Dingwall, Dornoch, Kirkwall, Tain and Wick in the Wick Burghs constituency of the House of Commons of the Parliament of the United Kingdom. Known also as Northern Burghs, the constituency was a district of burghs. It was represented by one Member of Parliament. In 1918, the constituency was abolished and the Cromarty component was merged into the county constituency of Ross and Cromarty. The town made the news in October 2012 when Bobby Hogg, the last speaker of the traditional local North Northern Scots dialect, died. This was referred to on HeraldScotland as a dialect of the Scots language, although a report on BBC Radio 4 said that the dialect had been strongly influenced by the English spoken at the local naval base and that it was one of the few areas in Scotland to exhibit H-dropping. Hogg had previously compiled a booklet of traditional words and phrases. In addition, the Highland Council had produced a digital booklet on the dialect. This states that the thou forms were still in common use in the first half of the 20th century and remained in occasional usage at the time of publication. ^ From 1890 (under terms of the Local Government (Scotland) Act 1889) to 1975 Cromartyshire was merged with Ross-shire under the Ross and Cromarty county council. Ross and Cromarty has later usage as the name of a district of the Highland region (1975 to 1996), and is today an area committee of the modern Highland unitary authority. ^ "Comparative Population Profile: Cromarty Locality". Scotland's Census Results Online. 2001-04-29. Archived from the original on 19 May 2011. Retrieved 2008-09-01. ^ AD Mills (1991). The Oxford Dictionary of British Place Names. Oxford University Press. p. 140. ^ David Ross (1994-10-01). "Prince views a 'jewel in the crown'". The Herald. Glasgow. Retrieved 2014-07-21. ^ "Project Background". Cromarty Medieval Burgh Community Archaeology Project. Retrieved 2014-07-21. ^ Ash, Russell (1973). Folklore, Myths and Legends of Britain. Reader's Digest Association Limited. p. 436. ISBN 9780340165973. ^ "Cromarty fisherfolk dialect's last native speaker dies". BBC News. 2012-10-02. Retrieved 2012-10-02. ^ David Ross (2012-10-02). "Dialect's demise as final speaker dies at 92". The Herald. Glasgow. Retrieved 2012-10-02. ^ "Rare fisherfolk dialect recorded". BBC News. 2009-05-05. Retrieved 2012-10-02. ^ Auslan Cramb (2007-02-21). "Brothers are last to speak dialect". Daily Telegraph. Retrieved 2012-10-02. ^ Matt Kennard (2007-02-26). "Anyone here speak Cromarty fisher?". The Guardian. Retrieved 2012-10-02. This article incorporates text from a publication now in the public domain: Chisholm, Hugh, ed. (1911). "Cromarty" . Encyclopædia Britannica. 7 (11th ed.). Cambridge University Press. p. 483. This page was last edited on 28 March 2019, at 11:11 (UTC).